When you’re a homeowner, things will inevitably go wrong. Your dishwasher will break on the weekend you have company coming over. Your AC will die on the hottest day of summer. Or, your oven will decide to die the day before Thanksgiving. When something goes wrong in your home, it’s always at the worst possible moment. That’s why it’s important to have some professionals on speed dial. 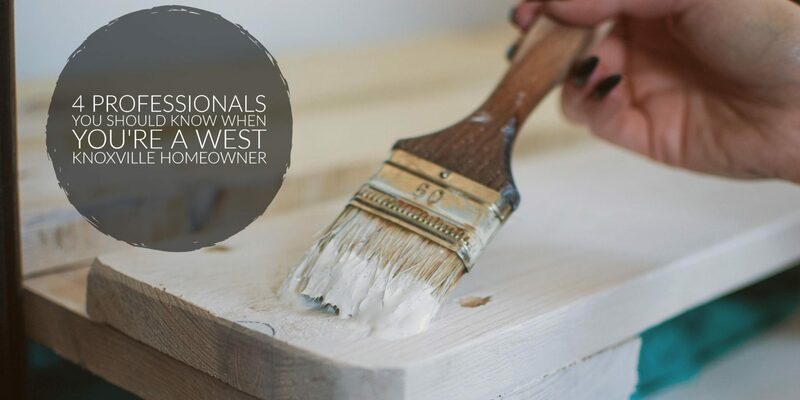 In this post, we’ll cover 4 professionals you should know when you’re a West Knoxville homeowner. A good, reliable handyman can be an important professional to to have on hand when you’re a West Knoxville homeowner. A handyman is a jack of all trades who can paint your house, repair some drywall, or help you renovate you bathroom. A handyman is often your go to person when you have a new project in your home. A reliable and affordable handyman is an essential person to have one speed dial when you’re a West Knoxville homeowner. A good handyman can help tackle a wide variety of project that come up in your home. When you’re a West Knoxville homeowner, it’s essential to have your home treated for pests. Unlike other areas of the country, Tennessee is warm a majority of the year. This makes homes more likely to be infested by bugs, rodents and insects. Before it becomes a problem in your home, be sure to find a pest control professional who can handle your concerns. Before hiring the first pest control company you need, just be sure that they address the issues that you need. If you’re already dealing with a problem in your home, make sure that they are able to treat and prevent future problems. Just keep in mind, not all pest control companies treat every problem. Some will just treat bugs and insects, while others will treat rodent problems as well. Some to these services treat your home once while others will want you to sign up for a contract. In order to keep your home pest free, you’ll probably need to have your home treated a few times a year to help keep bugs at bay. When plumbing issues occur, they often need immediate attention. Whether it is a toilet running or a leaky pipe, these items are often needed to be fixed quickly. This is why every Knoxville homeowner should have a plumber on speed dial. Plumbing issues can range to major issues to just minor. Regardless of the problem, these are issues that you don’t want to let linger. Find yourself a good, reliable plumber that you can call should you encounter an issue with your plumbing. Appliances are a critical part of your West Knoxville home. They clean your dishes, cook your food, and keep your clothes clean. Depending on what appliance it is, the cost of replacing the item can be an expense. Things like washers and dryers, ovens, and refrigerators can be expensive to replace. So, oftentimes, when these appliances break the first step is to see if the appliance can be repaired before you try and replace it. A dependable, honest appliance repair professional is important to have on your list of professionals. Oftentimes, it’s this person who will help you weight the cost of repairing and item or deciding to replace it. It’s important to find a professional you can trust and who won’t charge you an arm and a leg just to diagnose the problem. Get recommendations from friends and family members. Your realtor can also be a helpful person, since they know the people they need to call in a pinch. Find a professional through Thumbtack or HomeAdvisor. These apps let you describe your issues and get a quote before the professionals comes. It also allows you to read previous clients’ reviews. Look at Google, Yelp, or Facebook. Each of these sites allows reviews which can help provide you with a clear picture of that professionals works. Did we leave anything off this list? If so, sound off in the comments. Are you thinking about buying or selling a West Knoxville home this year? If so, do not hesitate to contact us. You can contact Rick at 865-696-9002 or via email at Rick@KnoxvilleHomeTeam.Com. Or, you can contact Kati at 865-696-1888 or via email at Kati@KnoxvilleHomeTeam.Com.